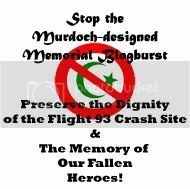 Blogburst: TBogg Deleted Evidence of Cover up at the Flight 93 Memorial — 1389 Blog - Counterjihad! 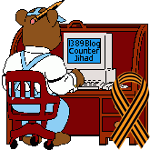 TBogg has edited a comment thread to remove an important piece of evidence about the Memorial Project’s cover up of Islamic and terrorist memorializing features in the planned Flight 93 memorial. A historically important comment left by a consultant to the Memorial Project has been deleted. In January 2006, Alec Rawls baited the TBogg leftists for insisting that it is perfectly okay to plant a giant Mecca oriented crescent on the Flight 93 crash site. TBogg’s comment thread swelled to epic proportions and eventually yielded something more than the usual litany of moonbat excuses for not thinking straight. At the end of the thread, posted sometime in March or April of 2006, there appeared an extended comment, about 600 words long, posted anonymously, and written as a semi-formal evaluation of Rawls’ January 2006 report to the Memorial Project. The Project only communicated snippets of the TBogg comment, so the fact that the whole thing had been posted online caught them by surprise, undermining their ability to control the story. You might recognize it as a giant crescent from an airplane like Flight 93 flying overhead, but from the ground? Pshaw. It’s too big to recognize! For most of 2007, the original TBogg comment thread has not been available, but TBogg now has it reposted, with one glaring omission: Dr. Jaques comment has been removed. If you want to see what TBogg is posting now, the url for his 2006 “Lunacy abounds” post is http://tbogg.blogspot.com/2006/01/lunacy-abounds-nuts.html. For posterity, here are copies of the original comment thread, as of 5/29/2006, with Dr. Jaques’ comment intact at the end, and the comment thread repost, as of 12/3/2007, with Dr. Jaques’ comment deleted. A full discussion of what TBogg properly calls “the infamous comment thread” can be found in Chapter Eight of Alec’s Crescent of Betrayal book (download 3, pp 131-). The question now for Mr. TBogg is why he deleted Kevin Jaques’ comment. Did he do it on his own, or did he do it at someone’s request? Did Dr. Jaques ask him to delete the comment? Did architect Paul Murdoch ask? 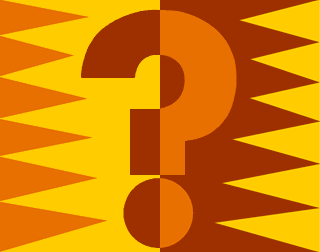 Did someone in the Park Service ask? Whether TBogg acted on his own or was prompted, it is obvious that he understood that he was deleting an important piece of evidence. Just the fact that he singled it out for deletion shows a conscious act of cover-up. Maybe he did not realize the full import of having the comment remain publicly available via an original source, but he certainly knew he was covering up something important. What kind of blogger deletes a piece of evidence that he knows to be central to a high profile controversy? (Republican presidential candidate Tom Tancredo (R-CO) sent the Park Service a letter last month asking that crescent design be scrapped entirely.) This is very bad behavior. Was TBogg’s comment thread originally removed in order to hide Jaques’ comment? It was odd enough when the “infamous comment thread” first disappeared from TBogg’s blog. What blogger removes anything famous from their blog? But at that time, there was no publicly available information that could have alerted TBogg to the significance of that last anonymous comment. The most likely explanation for the disappearance of the comment thread seemed to be that TBogg simply had a coding glitch, or maybe he is cheap enough to have been worried about bandwidth. Now that the comment thread has been restored without the Jaques comment, it seems likely that the reason the comment thread came down in the first place was to hide the Jaques comment. The interesting thing about this scenario is that, at the time the comment thread was removed (sometime between June 2006 and June 2007), the only way TBogg could have learned the importance of that last anonymous comment would have been through the internal investigation conducted by the Park Service in the spring and summer of 2006. Chief Ranger Jill Hawk, who was conducting the investigation, would not tell Alec who wrote the anonymous TBogg comment, but Alec warned her to be suspicious. Given the overtly dishonest nature of its excuse making, he urged her to double check its provenance. She answered back that she had been able to get email confirmation of authorship. This email communication with Jaques might well have alerted him to the faux pas he committed by posting his comment on the TBogg thread. Did he then contact TBogg and ask for the comment to be removed? That would seem to be the most likely scenario. Others who were privy to the internal investigation could have also contacted TBogg, but there is no evidence for any other such route of transmission. It is disturbing to think that TBogg would have acceded to any request to remove evidence about a possible enemy plot. He is fully aware of what Rawls is claiming: that an al Qaeda sympathizing architect entered our open design competition with a plan to build a terrorist memorial mosque – and won. Kevin Jaques’ TBogg comment is crucial for understanding how such a plot could succeed, revealing the utter fraudulence of the internal investigation that should have detected any such plot. As the lone consultant to the Memorial Project on the crescent design, Jaques engaged in overtly dishonest excuse-making. And TBogg is willing to help him cover it up? If TBogg has some other explanation for his deletions, the rest of us would sure like to hear it. For more of Kevin Jaques’ dishonest excuse-making, see last week’s blogburst on the fraudulent internal investigation. Before the Park Service was done, it managed to round up two more academic frauds in addition to Kevin Jaques. There is Dr. Daniel Griffith, who claims there is no such thing as the direction to Mecca, and a third Mosqueteer still to be discussed. (Saving the worst for last.) But Jaques is the central fraud, being the Project’s sole source of feedback during a crucial period when its dismissive posture was set in stone. In addition to being an expert on sharia law, Jaques has also proved to be an expert at taqiyya. Want to join the blogroll/blogburst for the Crescent of Betrayal blogburst? Email Cao at caoilfhionn1 at gmail dot com, with your blog’s url address. The blogburst will be sent out once a week to the participants, for simultaneous publication on this issue on Wednesdays. Previous post: Anderson Cooper KNEW Ret. Brig. Gen. Kerr? !